Tolles Hostel mit tollen Tipps von tollen Mitarbeitern. Immer wieder gerne! Really nice place. 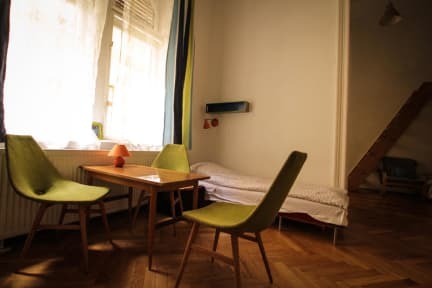 Very close to public transport, and in walking distance to places like the Gellert hill or the Market hall. Super-nice staff! The bed I slept in was a bit uncomfortable though. Schöne Atmosphäre, super nette Mitarbeiter. Jederzeit wieder! It was a really nice experience staying in this hostel. It’s super cute and the staff there was really helpful and nice. We had a private room and it was definitely not expensive. The location was really good as well, since it is located near the “center” you could say. Just a few meters away there are restaurants and bars. All in all there is really nothing we can complain about. Loved it!!!! 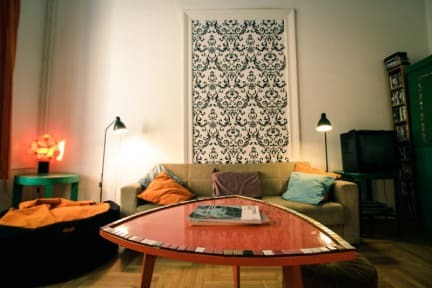 Feels like staying in a big, old and cozy flat with your flatmates - pretty cool! Wir waren zu zweit unterwegs und hatten einen sehr angenehmen Aufenthalt im hostel als auch in Budapest. Die Unterkunft liegt sehr zentral in der Nähe der Donau. Fußläufig ist alles super zu erreichen. Auch das Personal ist sehr hilfsbereit, gute Ausstattung. Wir würden wieder kommen. nice people, played cards and ate together.